The princely state of Karauli is one of the biggest states in British India, located in the north-west region of Rajasthan. It was established in the 11th century, but according to some ancient references it was also said to be a part of the Matsya Janapada. The royal line of Karauli was ruled by the Jadon Rajput clan and claimed to be the descendants of Hindu god Krishna. Bhanwar Pal ruled the Karauli State from 1886 to 1927 AD. During the reign, he issued gold, silver, and copper coins from Karauli mint. These coins were issued in the denomination of Mohur, Rupee, Paisa, and Takka. 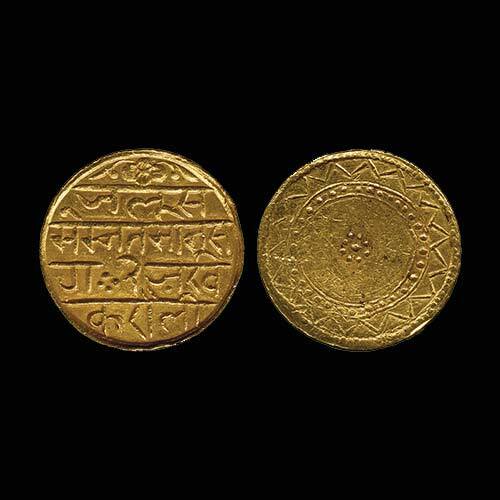 The above shown extremely rare gold Mohur struck under the rule of Bhanwar Pal. The obverse of the coin depicts the inscription (probably Sharada script). The reverse depicts a central dot with eight dots around, and a circle of dots and semi-cross hatch at the border.